This winter I’ve been printmaking using easy-peasy materials. I enjoy the high contrast and the textures that printmaking presents, and I wanted to bring that same feel to my next painting. Inspiration comes from different places all the time. In the case of this painting the color, the tulips, the pears, the spring season, and the friendship behind the vase all combined to inspire me. At the grocery store the other day I bought these gorgeous tulips and some very plump, luscious, tasty beautiful pears. I have to confess that I bought the pears because of their colour. I knew that I had to use that color in a big way in a painting! Good enough to paint AND eat! I decided to use the pear green as the background color. I use Golden Fluid Acrylics for most of my acrylic painting. I like the intensity of the pigment and the fluidity. For years I painted exclusively in watercolour and the transition to painting with acrylics felt better using fluid paints. I keep practicing painting with a reduced palette, because in my experience, it results in more harmony to the painting. The colours I choose are often determined by how I feel about the colour and the given subject matter on the day that my painting starts. Some days pea green “speaks” to me, and on other days I am drawn to a coral colour. So, just to be on the safe side, this time I coated out canvases with both colours! Coated canvasses wait to be painted. After studying my subject matter and moving my props around for awhile; after putting on some music and making the perfect cup of tea, I sketched out my big shapes with chalk, erased some of them, moved the shapes around, added more, erased and generally played around with the composition until I felt satisfied with it. Then I captured those shapes with paint. It’s just a guide because as I get into the painting, I will still change the position of objects. The painting objects are sketched on with chalk and then with paint. While I’m drawing it out, I’m thinking about what colours I’ll use. For me, the subject matter is for reference only and I rarely do a literal reproduction of the exact object or colours. Although I bought the parrot tulips for their colour and shape, on painting day the red didn’t appeal to me anymore so I changed their colour. 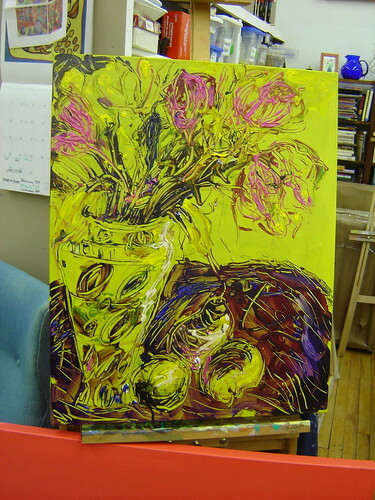 I open up my paints, adding a dioxine purple to the original colours that I used in the background. 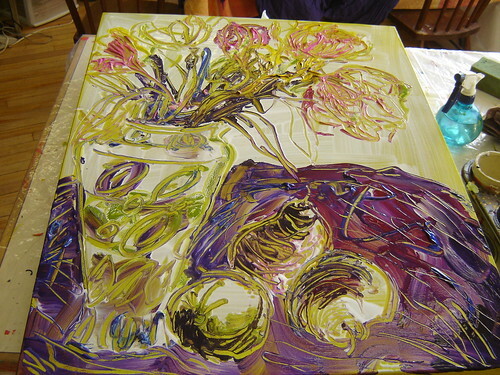 Even though many of my paintings appear to be still life paintings or flowers–a generic subject matter, they are all actually quite personal. Tulips represent rebirth and new beginnings to me and so does the yellow-green colour. But the vase in this painting is what tells the real story. It is a reference to a wonderful man I worked with for many years in Toronto in adult literacy. 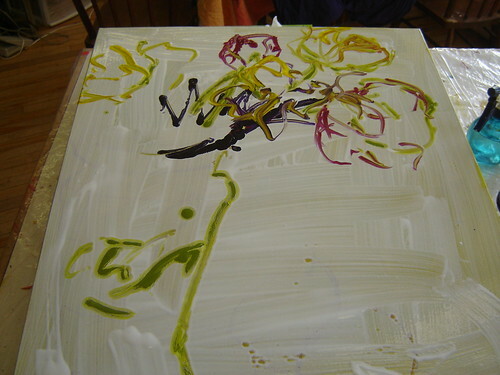 The final flower set up for the painting. I could tell you a lot of things about my colleague – his sharp wit, his ability to understand complex computer concepts and explain them in non-patronizing ways to the rest of us. I could tell you how every day at lunch he would pull out his pocket knife and carefully peel several pieces of fruit leaving behind one long coil of skin or rind. Or I could tell you about the beautiful smooth, round flat stones he had collected from Lake Ontario that littered his office. Matt medium is smeared all over the canvas for two reasons. 1) It delays the drying time of the paint. 2) It allows me to used my rubber scraper and draw into the paint to reveal the background. The medium will dry transparent. The first bit of paint is squeezed out of the bottles onto the canvas. But instead I will tell you that one day I found myself leaning in his office doorway and telling him about the fear and anxiety I had felt for months at work. I started to cry and I couldn’t stop. I didn’t know him very well and I was embarrassed at my display of emotion but at the same time I was very relieved to be able to share with him the nightmare I was feeling at work. When I returned from lunch, there was a gigantic bouquet of flowers on my desk. I think I must have cried again! It was such a kind gesture of support and affirmation. It takes patience to wait for the matt medium to dry, revealing the true colours. A few weeks ago, about seven years after that episode, a beautiful vase arrived in the mail. My friend and his partner were housecleaning and came across this vase which reminded him of my paintings. He packed it up and mailed it out here to me. Another gesture of his generosity. It feels good to have a piece of Alan’s energy here in the studio and it’s just the kind of inspiration a new painting needed. I am happy with the painting so far, but I need to spend some more time on the flowers, and maybe the background too. The perfect music helps the painting. Coming here to live in Bear River has been a rebirth and renewal of my creativity because it has given me the opportunity to spend more time painting, writing and smelling the tulips. < Printmaking with Foam and a Ballpoint. That looks like it was fun to create!